Brian Dean, a seasoned ISA certified arborist on the Gail Willey Landscaping staff, has a plethora of knowledge and is a go-to on all things regarding plant life. Here he explains how to spot turf disease, and how to handle it. Dollar spot looks like drought stress (lack of water). Grass blade tips look bleached or straw colored. Turf under stress is more susceptible to infection. 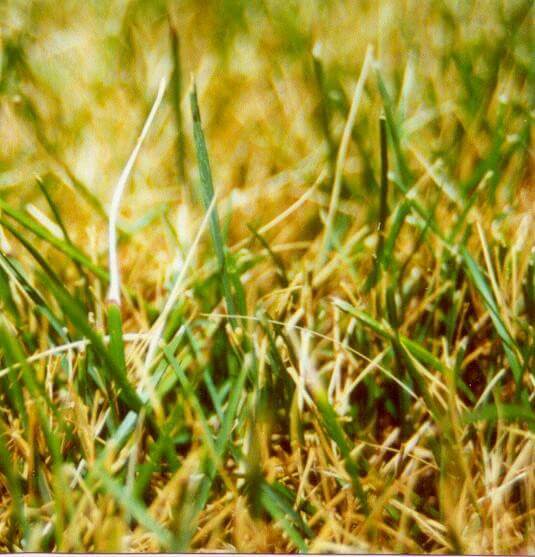 Small areas in turf become yellow with individual grass blades turning straw colored. These areas are mistaken for water stress. Upon close inspection of the grass blade, tips and middle parts appear bleached often with a brown to purple band where the green and white areas meet. When the turf is wet from early morning dew, a cobweb like mass of fungal growth may be present. As the grass dries the fungus disappears. Turf under stress such as drought, low fertility, improper mowing (too often, too short, and dull mower blades) and high salt levels are most susceptible. When long periods of continuous moisture (14-16 hours) within and foliar canopy exist, disease outbreaks may be severe and spread is very rapid. Heavy thatch layers also promote disease due to the inability of water, oxygen and nitrogen to reach the roots. Proper management is the key to prevent and control the disease. Aeration, fertilization with nitrogen, cutting grass at 2-1/2 to 3 inches with sharp mower blades, and especially proper watering are essential to keep the disease at bay. Proper watering includes: irrigate infrequently (2 to 3 days a week) and deeply (6 to 8 inch soil depth), be sure to allow the grass to dry out at least an hour before sun down and one hour before watering in the morning.